On this day in 1909, Port Richmond featherweight Tommy O'Toole won a six-round newspaper decision over Patsy Kline of Newark, NJ in the main event of a Saturday night fight card at the National Athletic Club in South Philly at 11th & Catherine. Kline, born Pasquale Gengro in Naples, Italy, took the first round of the bout and added the third to his column according to the newspaper reports of the day. But other than those two rounds, the bout belonged to O'Toole. In these the early days of "no decision" fights, O'Toole had to rely on the newspaper reports to determine a winner. Most felt "The Pride of Port Richmond" had earned the victory. On the under card that night, Joe Thiel beat Joe Burns in another six-round newspaper decision, and Johnny Dougherty won his six-rounder over Willie Beecher the same way. O'Toole was a popular scrapper in Philadelphia who rarely traveled out of the city for his matches. He hated the road and easily filled a long career mostly with local bouts. Even the majority of his big fights - Johnny Kilbane, Pal Moore, Ad Wolgast, Owen Moran, Kid Beebe, and one of his bouts with Abe Attell - took place in Philadelphia. O'Toole's rematch with Attell for the featherweight championship was set all the way in Boston. Attell won a 12-round decision. 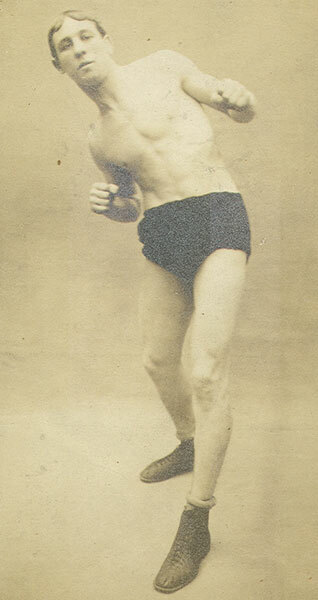 In all Tommy O'Toole fought about 120 bouts in his ten-year career. After retiring from the prize ring, he became a Vaudevillian dancer. He and his partner Henrietta Gores played many of the big Vaudeville theaters up and down the east coast. Perhaps traveling as part of a dancing act was easier than fighting in someone else's backyard.